Subtitled, another fine failure at anti-racist art! It seems to be open season on 'racist' art in Britain these days. Brett Bailey's Exhibit B didn't make it to opening night at the Barbican but triggered an outpouring of debate on whether it would or would not have been racist if it had. My views on that one are here. Now we have Banksy, who goes around painting very expensive graffiti on walls, hitting Clacton-on-Sea with the mega-million buck masterpiece shown below. Clacton could have sold it to buy themselves a new sea wall, but instead it seems they have destroyed it because a member of the public complained it was 'racist and offensive'. Jonathan Jones at the Guardian isn't buying this story. He thinks Banksy's piece is 'quite plainly an eloquent attack on racism'. Since he suspects the good people of Clacton-on-Sea of significant ingrained racism due to the fact that a UKipper is about to stand for election there, he believes the only reason they would tear the mural down is because 'it hits too close to home' and makes them feel squirmy. By the way, I think we might be talking about xenophobia here rather than racism, but since the former seems to be considered acceptable by so many, I'm choosing to cynically believe we're using the word 'racism' to try to trigger appropriate responses in people. Just like Banksy really, but was his painting likely to work? Let's imgaine a member of the public completely unfamiliar with Banksy and his work, yet familiar enough with the anti-immigration political discourses going on in his or her town, and disapproving on them. Will it really be so obvious to them that the art work is on their side? I'm not so sure about that. What Jones is overlooking is that the only eloquent things in the painting are the racist pigeons and what they're saying is exactly what the racist politicians and their supporters in the same environment are saying. How can the piece be effectively anti-racist when it offers no counter-arguments, no condemnations, but just sits there reinforcing the same old local racist messages? How can it be effectively anti-racist if it's only method (apparently) is to hope its viewers find the swallow small and sweet enough to start feeling sorry for it? 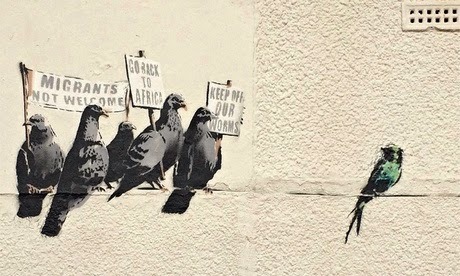 Now imagine a resident of Clacton-on-Sea who knows nothing about Banksy but is vehemently anti-immigration. They regularly hand out messages like those on the placards with no sense of shame whatsoever. They see no benefits or attractions in the smallness or sweetness of swallows in Britain. Does a 'confrontation' with this painting on a wall actually give them a communication about how others perceive them and why they should stop? Or does it confirm them in their actions? It seems to me the only really convincingly negative thing about the pigeons is the message on their placards but to see that you have to be the type to perceive those messages negatively! Sorry Jonathan Jones, I think you and I only know this piece is 'plainly anti-racist' because we know who Banksy is and we move in circles where the messages on the placards meet with open disapproval. I'm sure anti-racist art can do better than this, so I'm now officially on the lookout for excellent pieces. Anyone want to send me one for review?